Polliwog YMCA swim lesson is a beginner level for school-aged children. No prior swimming experience necessary for this swim lesson. Students are introduced to basic stroke development, personal safety skills, water sports and games in a friendly environment with peers. This swim lesson is designed for students who have completed the Polliwog class. Children will continue to improve their Freestyle and Backstroke. They will be introduced to deep water swimming skills including personal safety in deep water, diving and treading water. Children will also learn rotary breathing and will be introduced to Breaststroke and Butterfly during this YMCA swim lesson. The Minnow level is designed for students who have completed either the Guppy or Starfish swim level. This swim lesson will continue to introduce students to diving, treading water, increased distance for Freestyle and Backstroke, as well as deep water swimming skills. It will introduce lap swimming techniques to students and will focus on stroke refinement and endurance. Students continue to focus on lap swimming skills, stroke refinement and endurance in this swim lesson. They will continue to learn about water sports and games, increase distance of Freestyle, Backstroke and Breaststroke, person safety and basic rescue skills in the YMCA swim lesson. Flying Fish swim students continue to perfect lap swimming techniques and focus on stroke refinement of Freestyle, Backstroke, Breaststroke, and increase distance of Butterfly in this YMCA swim lesson. They will continue learning basic rescue skills such as throwing assists in this swim lesson. Sharks focus on advanced stroke technique and endurance of Freestyle, Backstroke and Butterfly during this YMCA swim lesson. Discussions include basic First Aid and survival techniques. Students will continue to work toward preparation for the swim team once completely this swim lesson. The Lima YMCA Barracudas Swim Team serves swimmers ages 5 through high school. Swimmers must be able to swim 25 yards freestyle prior to joining the team. The program offers instruction, training, and competition at all levels of swimming. The team produces multiple Zone and National qualifiers. Flexible practice schedule and a variety of training groups suited to a swimmer’s ability. The team is committed to swimming excellence in an enjoyable environment that places emphasis on the core values of honesty, caring, respect, and responsibility. We are excited to announce that we are also now a USA swim team. USA Swimming in the national governing body for competitive swimming in the United States. This program will give swimmers of any level additional opportunities to swim at some of the best facilities in the state of Ohio. Are you in the Cub Scouts, Boy Scouts, Girl Scouts or Brownies? 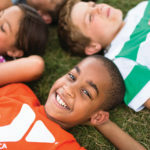 Bring your scouts to the YMCA to earn their aquatic badge or patch. Contact the Aquatics Director at (419) 223-6045 ext. 220 to make your reservations today.